Holiday garland perfect for Christmas. Like our wreath, the San Francisco Estate Garland offers cedar, magnolia, and thistle in a beautiful 5' garland that perfectly complements our San Francisco Estate Wreath. It's a gorgeous touch for your holiday decor - on a stairway, mantle, or doorway. 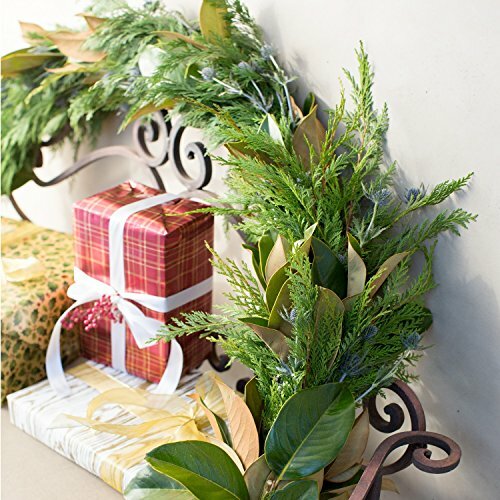 All of our fresh garlands for Christmas are made of materials harvested in California and the Pacific Northwest. Garlands for the holidays are designed to last 3 + weeks. Some foliage is naturally hardier and will last beyond the season. All Christmas garland materials are fully recyclable. The plant material can be composted and will biodegrade naturally and the metal wire can be recycled. If you have any questions about this product by Club Botanic, contact us by completing and submitting the form below. If you are looking for a specif part number, please include it with your message.